After a minor technical glitch interrupted the countdown for five minutes, Arianespace’s Ariane 5 rocket left the pad at the Spaceport in Kourou, French Guiana, at 5:15 p.m. EDT (21:15 GMT) on June 28, 2017. 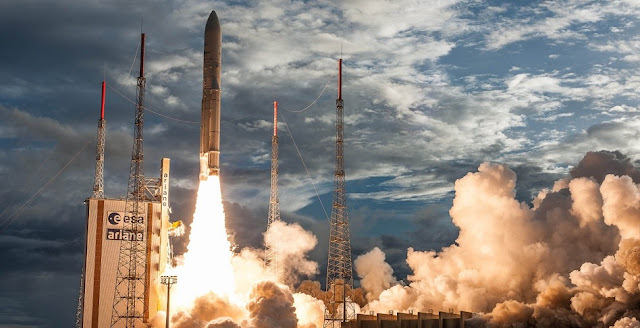 Flight VA238, as the mission was named by Arianespace, deployed two satellites – Hellas Sat 3 / Inmarsat S EAN and GSAT-17 – into a geostationary transfer orbit (GTO) 39 minutes after lifting off, completing the fourth Ariane 5 launch of the year. While tropical thunderstorms threatened to delay the mission, conditions improved enough to allow for an (almost) on-time launch at five minutes after the opening of the 77-minute window. At T-minus 0 seconds, the core stage’s Vulcain 2 engine roared to life. Approximately seven seconds after main engine ignition, and after passing health checks and allowing the main engine to reach flight thrust levels, the flight computer signaled the twin P241 solid rocket boosters (SRBs) to ignite. The output from the trio was more than enough to lift 20,408 pounds (9,257 kilograms) of satellites, plus the mass of the rocket and its propellant, off the pad. With a combined 2.92 million pounds-force (13,000 kilonewtons) of liftoff thrust, the 180-foot (54.8-meter) tall Ariane 5 climbed from the pad and soared into a cloudy nighttime sky, with the roar and crackle from the three engines echoing across the jungle. Shortly after clearing the launch tower, the Ariane 5 turned eastward and climbed over the Atlantic Ocean. As the rocket climbed and gained velocity, atmospheric pressure reached its maximum impact on the vehicle’s structure. This region of high stress is called “max Q” and is a function of the vehicle’s speed combined with the pressure exerted on the rocket by the surrounding air. At nearly the same time, the Ariane 5 surpassed Mach 1 – the speed of sound – as it continued its rapidly accelerating climb to orbit. After passing through this part of its flight profile – the most stressful on the rocket throughout its ascent – the dynamic forces began to rapidly dissipate. Slightly more than two minutes after ignition, and at more than 37 miles (60 kilometers) in altitude, the Ariane’s pair of solid-fueled boosters exhausted their propellant and were jettisoned. Unlike the boosters from the now-retired U.S. Space Shuttle program, the spent motors were not recovered after splashing down into the Atlantic Ocean. Though only operating for marginally more than two minutes, the SRBs accounted for more than 90 percent of the Ariane’s thrust at liftoff. However, with the vehicle weighing significantly less than it did on the pad, the core stage’s Vulcain – burning through approximately 700 pounds (317.5 kilograms) of fuel and oxidizer per second – was able to supply the power necessary to continue accelerating the lightened rocket and its payload. Approximately three-and-a-half minutes into the flight, and at 68 miles (110 kilometers) in altitude, the Ariane jettisoned its 55.8-foot (17-meter) long protective payload fairing. Though the aerodynamic shell protects the vehicle and its payload from acoustic, aerodynamic, and thermal stresses in the lower, thicker parts of the atmosphere, it becomes unnecessary mass – and a barrier to payload deployment – once in the vacuum of space. The Vulcain main engine powered the vehicle for nearly nine minutes, and, once the core stage was depleted of its liquid oxygen (LOX) and liquid hydrogen (LH2) propellant, it separated from the ESC-A (second) stage and fell into the Atlantic Ocean off the coast of Africa in the Gulf of Guinea. The ESC-A’s highly efficient HM-7B engine, burning a cryogenic mixture of LH2 and LOX, started its 16-minute long burn to place the two satellites in their intended GTO delivery spot. Twenty-eight minutes after lifting off, the ESC-A was in a position to deliver the first of its two passengers to the 155-mile (250-kilometer) by 22,236-mile (35,786-kilometer) transfer orbit. Hellas Sat 3 / Inmarsat S EAN was the first of the satellites to separate from the vehicle’s SYLDA payload adapter. After the Thales Alenia Space-built satellite was clear and at a safe distance, SYLDA was jettisoned, exposing GSAT-17. Following a short coast, the Indian Space Research Organization (ISRO) GSAT-17 satellite was free to deploy. Both satellites will raise their orbit with their onboard propulsion system while undergoing a set of checkout procedures by the ground crew before being declared operational. Flight VA238 marks the seventh overall mission for Arianespace in 2017, with five more left on the manifest for the year. Coming next for the French multinational launch provider is the launch of their lightweight Vega launch vehicle on Flight VV10, carrying Optsat 3000, scheduled for July 25, 2017.